Seattle Seahawks cornerback Richard Sherman has become the vocal leader of the NFL ever since his rant against Michael Crabtree and the San Francisco 49ers aired. He continually grabs headlines, but mostly in a positive light, questioning racial stereotypes and bigger issues than just what transpires on the football field. 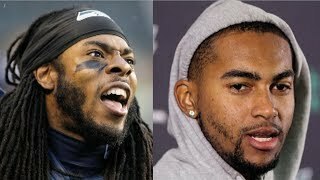 In his piece for the MMQB (Peter King's fine website) Sherman discusses the Philadelphia Eagles decision to release DeSean Jackson because of so-called "gang ties" and compares that with society's stereotypes towards Riley Cooper's "n-word" video and Jim Irsay's recent DWI where he had $29,000 in cash in his car. Yet Jackson is painted in a far negative light. Why? Stardom Doesn’t Change Where You’re From Amid reports of gang ties, the Eagles cut DeSean Jackson. I grew up with him. I believe him to be a good person.